Though the chiavari chair rental may cost a bit more than your average wood or wood chair, it is definitely worth the investment. The main appeal of the chiavari chair is its sheer simplicity. When it comes to decorating, often times than most, less is more! Less is more. The chiavari chair may not be all jazzed up with intricate designs, glitter, flowers, and other decor, but boy does it deliver elegance and sophistication. Chiavari Chairs are known to be very portable because they don't weigh much at all. Wooden Chiavari chairs only weigh around 10 lbs. This makes the chairs very easy to transport, very easy to arrange, easy to stack, and easy to store. However, keep in mind that not all Chiavari chairs are made equally. Some manufacturers have higher grade chairs while others have less quality grade resulting in less durable chairs. To ensure the safety of your guests, you don't want to save a couple bucks by renting out cheap Chiavari chairs. 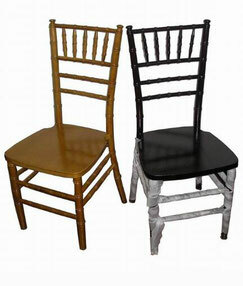 Chiavari chairs are customizable. They come in a variety of different colors such as silver, gold, black, white, natural and so forth. Two of the most popular choices for weddings are gold and silver. However you can mix and match or just pick out chairs of the same color that match up with your decor. Another option is to customize the color and fabric of the cushions. Depending on where you order your Chiavari chair rentals, you might have the freedom to change as you please. If you're not too creative and need inspiration when it comes to planning out your wedding, luckily for you, Chiavari chairs are frequently portrayed in movies, important events, hotels, museums functions, and wedding magazines all over the world! Just by Googling Chiavari chairs, you have more than enough inspirational ideas for how to incorporate these chairs during your wedding ceremony. Often people who rent out chairs have to rent out chair accessories. Often times, generic chair rentals are plain and boring. Brides often feel the need to spruce it up by adding additional decoration. Adding additional decor to your chairs plus the cost for the chairs usually end up costing around the same as simply renting out Chiavari chairs. So if you're looking for a beautiful and easy solution, invest in Chiavari chairs-they are perfect as is. Do you plan on using chiavari chairs for your wedding? Share with us your thoughts below!